For optimum frothiness, make this shake at the last minute, although if you are having it for breakfast, you can prepare and chill the purée the night before. Place the fruit in a blender or food processor and blend until smooth. Chill until needed. Just before serving, place the fruit purée, milk and honey to taste in the blender or food processor. Process until foamy and serve immediately. 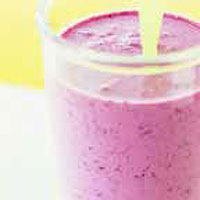 For a really luxurious shake, omit the honey and add a scoop of softened vanilla ice cream to each glass.